Start decorating your pumpkin as soon as it becomes available on the farms, in stores or at pumpkin patches. Children will have lots of fun with these pumpkin crafts for kids: painting pumpkins, stamping projects and drawing fun images. An outdoor painting station is a great idea for the little ones. Let them get creative and enjoy painting faces or bats on the big yellow pumpkins. 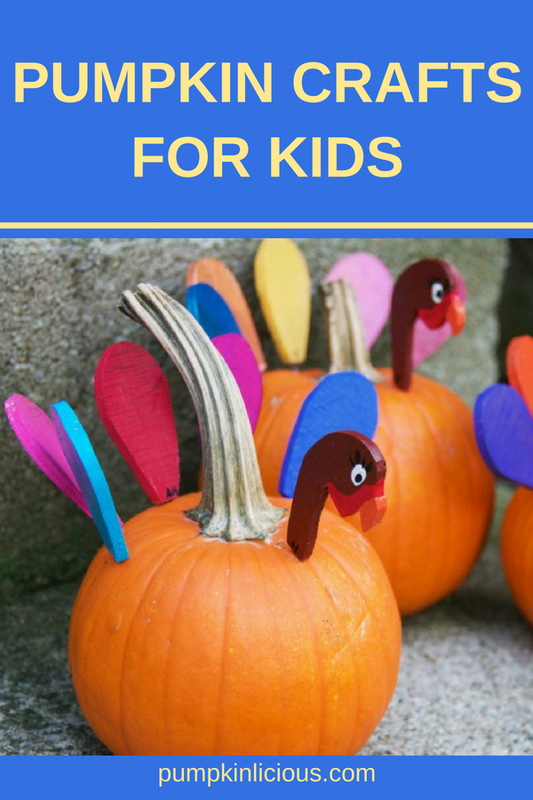 There is such a large variety of pumpkin craft ideas for kids, and many of the materials such as paint and glue you already have at home, or cam make yourself. Toddlers and kindergarten kids will have fun painting pumpkins, and older children can enjoy exciting scientific pumpkin activities. October is a month you can really go over the top with store and homemade decorations. Remember to involve the kids in decorating the yard. They can paint pumpkins and even help you carve them. It is easy to draw a big fat pumpkin. 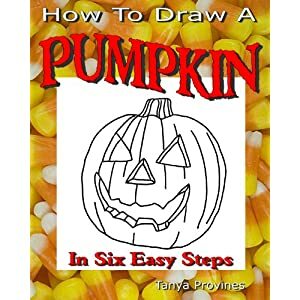 How To Draw A Pumpkin In Six Easy Steps You begin by drawing a large circle. This will be the actual size of the pumpkin. Draw a small oval shape in the middle near the top of the circle where the stem will be. It is now time to draw the mouth, eyes and nose. Use a triangle for the nose and oval shapes for the eyes. Zigzag patterns around the mouth will make any face look scarier. Draw a small stem sticking out from the oval shape in the circle. The ribbed section of the pumpkin is done by drawing four lines from the top down to the bottom. Draw more lines around the rest of the pumpkin. The last step is to color the inside of the mouth, nose hole and eye holes with black paint. BioColor is a non-toxic paint and safe for children’s use. The paint adheres well on pumpkins and has a glossy finish. But since busy moms do not always have time to go shopping for arts and crafts, they can make their own paint. Homemade paint is perfect and safe for toddlers and quick to make. It is also easy to clean. Pour half a cup of corn syrup in a container and add food color drops. Mix it well and your toddler will love the unique shiny finish of his or her artwork. Whisk one box of vanilla instant pudding mix with two cups of ice-cold water. Divide the mixture into three separate containers and add food color of your choice. Mix the pudding paint well and let your toddler have fun. This paint produces more vibrant colors. Use three parts of white vinegar and two parts of cornstarch and mix well in a bowl. Add a few drops of food color. Mix ¾ cup of water with the ¼ cup of cornstarch in a saucepan over not too high heat. Add one teaspoon of white vinegar and two tablespoons of corn syrup. Keep on stirring the mixture until it thickens. After painting the pumpkin, your toddler can glue shapes to the pumpkin. And so with one activity your child will have fun and learn about shapes and colors. Another exciting activity is to make a glitter pumpkin by brushing glue onto the pumpkin and then roll it in sugar crystals. Kids love to decorate things with stickers. Mailing labels or hole reinforcement stickers are great to decorate pumpkins with. Make a template of a bat or spider and stick it to the pumpkin. Paint over the template and once the paint is dry, remove it. Polka dots can be printed all over the pumpkin with paint. Use a round object to transfer the paint onto the pumpkin. For older kids, try this amazing science project. You need water, tray, pumpkin, small bowls, a magnifying glass, plastic knife and tongs. Your child can prepare everything for the tray like a scientist working in a laboratory would. 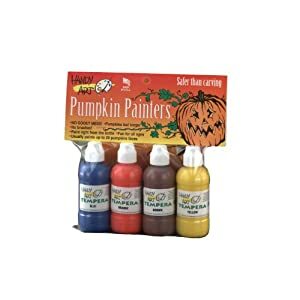 Handy Art® 4 color – 2 ounce Tempera Pumpkin Painters Kit Use white paint and butternuts to make funny faces. Paint the entire surface of the butternut white and use black and grey paint for the eyes and mouth. Once the paint is dry, you can dress the butternuts up with funny hats or glasses. Patterned painting is easy and lots of fun. Cut squares out of paper and attach it to the pumpkin with double-stick tape. Paint the entire pumpkin with the paint of your choice and once it is dry, remove the paper-squares. Paint a small pumpkin black and glue on eyes, mouth and legs to make a fun spider. You’ll need a small pumpkin, glue, white craft foam for the mouth, eyes and chenille stem for the legs. Get a first-aid kit and give it to the children. Have them wrap the gauze around the pumpkin and draw two eyes and a mouth with a black marker, and you will have the silliest mummy in your area. Hope you see that pumpkin crafts for kids can be cheap and exciting to make. And through all this pumpkin fun playing, kids will learn a lot. 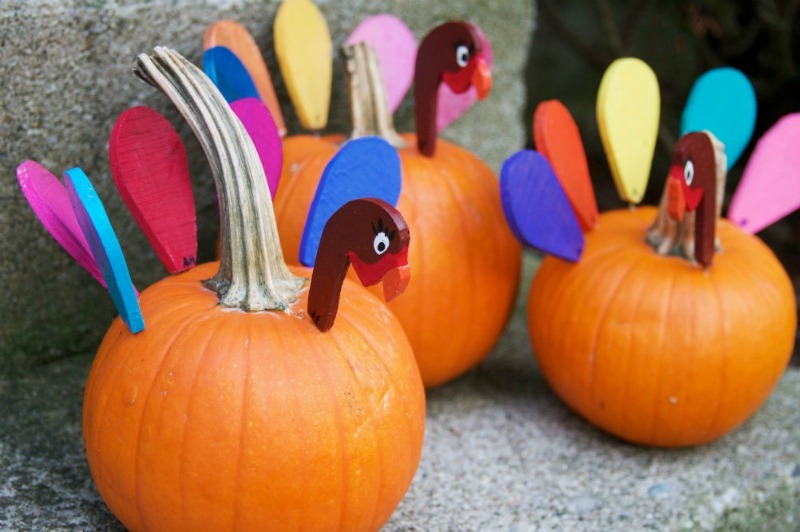 Let the fun begin this fall with these and other pumpkin crafts for kids.